These 16 pieces of suction anti-slip rug grippers can simply be stuck to the back of a mat. The glue will not remain, and they can be washed repeatedly. It is easy to take them off. Use them on mats at the entrance, in the kitchen, or bathroom. The 1 pieces of gel pads can let you stick anything at anywhere. 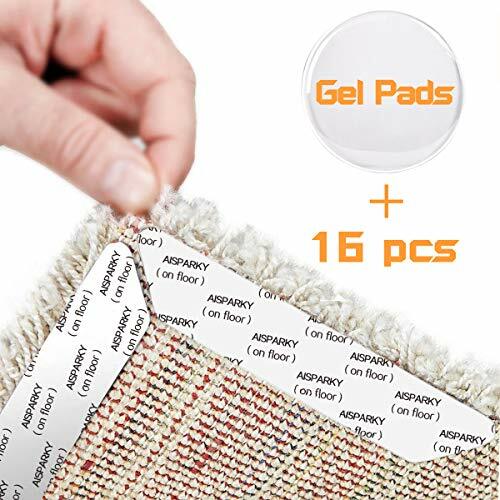 The adhesive surface of the rug grippers cannot be peeled off once affixed. If the adhesive portion is stuck to the floor as you remove the mat, wipe it with a wet cloth. When drying the anti-slip sheets after washing, do not expose them to sun light for an extended period of time. Before attaching the anti-slip sheet, thoroughly remove any dust off the surface of the mat. Peel off the mat's protective stickers and place the adhesive side on the mat. Wipe the floor before placing the mat to remove any wet spots or dirt, place the mat on the floor with the adhesive side of the anti-slip sheet under the mat, and press it to firmly stick to the floor. ★Wondering how to keep rugs from slipping? This is a problem that troubles many housewives. To address it, we provide 16pcs rug grippers and 1 pcs gel pads. This method uses AISPARKY rug grippers which grips all types of floors firmly and easily. Including tile ceramic, hardwood, laminate, etc. ★Easy install and works great. Anti-skid and anti-curl. The more pieces used, the better the rug will be anchored to the floor. Remove the adhesive backing and stick the discs to the bottom of the rug you want to secure. Then remove the film covering the silicone surface and press the rug firmly onto the floor. ★Washable & Renewable. For renew the sticky surface simply wipe with wet cloth or wash it in the flowing water and let it dry in open air. Great product, and renewable, environmental friendly. ★About the gel pads. It can let you stick anything at anywhere. And can reusable through wash it in the flowing water or wet cloth to clean. ★Guarantee. A 100% guarantee accompanies this product. This ensures that your rug remains securely in place, and helps to prevent accidental slips and falls. If you are not 100% satisfied, send us a message and we will make a refund. The item is Fulfilled by Amazon , should be delivered in 1 week , enjoy the fast shipping. If you have any questions about this product by AISPARKY, contact us by completing and submitting the form below. If you are looking for a specif part number, please include it with your message.